Here are our plans for the channel for 2018. We want to make 2 short films, create a directing 101 series, create more kit and DIY video, along with making The Film Look Podcast. Season 4 is here! We have over a dozen episodes ranging from writing to shooting to costume design. We have broken down the process of the whole film so you can learn exactly how we made it! Raiders of the Lost Ark | How did it achieve the film look? Raiders of the Lost Ark: It’s a classic action adventure film that I’m sure we all watched as kids. It certainly has, what I would consider, The Film Look. There’s something about it, visually, audibly, and immersively, that screams “This is a great movie experience!”. But how does it achieve the film look? Let’s break it down! This video is our 100th video on YouTube. To celebrate the channel's 1st birthday we hosted a Facebook LIVE event with a Q&A and a giveaway of some prizes. We recorded the whole thing, and created a fat-free version for you to watch! This is what you need to do in order to get the Film Look for your short film. Today we are going to talk about criticism: receiving feedback, giving feedback, how to do it constructively, and how not to take things personally. Learning how to receive criticism is something we all go through as filmmakers, and at first it can sometimes feel like an attack. If you are used to your friends and family telling you how great your short films are, and then someone comes along and steps on it, we tend to take it personally. I know I did! But being told only positive things isn’t going to help us grow. Norman Vincent Peale is famous for saying “The problem with most of us is that we would rather be ruined by praise than saved by criticism”. That shallow desire for positive reinforcement is tempting, but it’s not helping us improve our work. This is where constructive criticism comes in. As opposed to generic feedback, constructive criticism should contain helpful and specific suggestions for improvement and positive change. Someone might rip your film to shreds. But if they give you alternatives, suggestions, different ways of execution, better ways of creating, you can take all that advice and apply it into your next film. Personally, I love getting my film ripped to shreds. I want people to pick at it and destroy it, and from that destruction I can finally see the faults which I wouldn’t have noticed if people weren’t so aggressively helpful with their feedback. But there is a difference between feedback for improvement and someone’s personal taste. Not everyone likes the same things, and sometimes a few suggestions based on their taste can be thrown in. If you like something in your film, if you feel that certain element is crucial to your project and that changing it will change the film…then fight for it. It’s your film after all, and if you can justify your reason for a certain element, that is your right as a filmmaker. All of this applies when you are the one giving feedback too. Remember how it felt to have your film attacked. If you are giving criticism, give some examples of how it can be improved. And talk about what you DID like in someone else’s film. Just because you are giving feedback, doesn’t mean you can’t praise the positives as well. It is quite often harder to do so because the positive elements are invisible in the film, but if you think “everything I see on screen has been crafted by individuals”, it can help put a spotlight on those invisible elements. Feedback isn’t just at the premiere of the movie either. Having someone read your script and give their opinion will help you see things you might not realise were there/or weren’t there. During shooting, you have a team of people around you, why not use those individual brains and ask them their opinions are on the day. And it’s not just filmmakers you should gain feedback from. Sometimes asking for constructive feedback on your film from someone who isn’t a filmmaker can be tricky. The best thing to do in a situation like this is to ask them questions about it. 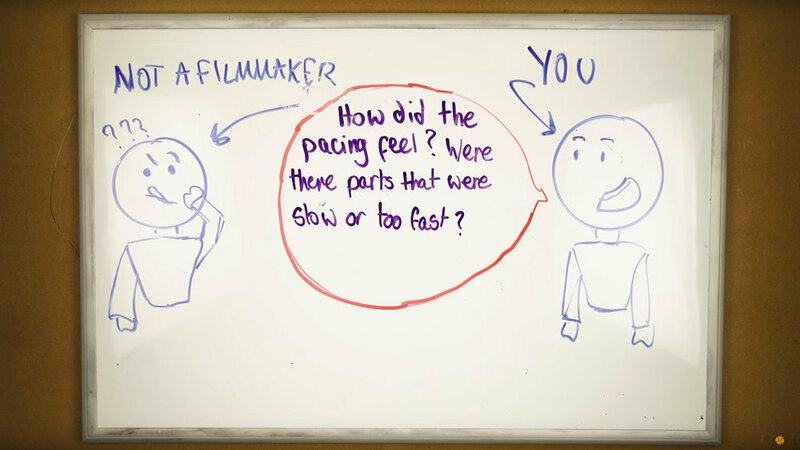 “Can you tell me what you thought the film was about?”, “How did the pacing feel? Were there parts that were a slow or too fast?”, “How do you feel about this character?”. Asking open questions to non-filmmakers will help them give you an answer without getting the response “Oh, it was good, I liked it.” You sometimes find that those who haven’t studied film don’t know WHY they liked or disliked certain pieces of a film, and by asking them open questions, they have a chance to really find an answer. What’s great about feedback from non-filmmakers is their unique viewpoint of it. To them, it isn’t a crafted piece of work, it’s simply entertainment. They aren’t looking at the shots, or listening out for sound effects, they just take it in. And if your film isn’t entertaining, it hasn’t succeeded in its most primal form. In some ways, it’s their opinion is all that matters. Today we share with you our plans for 2017! Two English filmmakers, Rob & Rich, try to tackle what it takes to make a movie. An in-depth video series into many aspects of filmmaking; from script to screen.